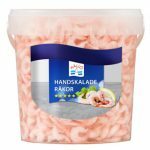 Hand peeled cold water prawns from HÅLLÖ are our finest prawns. They are caught in the cold waters off Greenland’s and Canada’s coasts, and cooked within an hour and then frozen directly on the boat that caught them. The prawns are then peeled by hand, and this fine craftsmanship helps preserving a taste and texture that compares to the freshly cooked prawns on the fishing boat. Moreover, they have a great and uniform size, which is highly appreciated by our customers. We never compromise on sustainability. 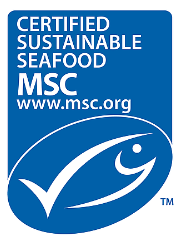 MSC stands for Marine Stewardship Council, and having the privilege of using their label on our products means that we can ensure that the prawns come from sustainable and well managed fishery. With full traceability from finished product all the way back to the actual boat that caught them.